Check out Volume 3 of Make Healthy A Lifestyle at www.LindaLaRue.com, featuring some great articles where you'll find healthy tips and recipes that will save you Calories that will help you whittle away your waistline--not your wallet--this holiday season! I've posted a Healthy Holiday Meal Makeover by my friend, Robyn Goldberg, RD that will save you up to 100's of Calories without sacrificing taste. 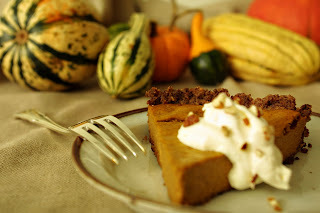 I posted my yummy pumpkin pie with pecan crust that is only 125 Calories per slice. Did you know on average the typical serving of pumpkin pie is 480+ Calories? Yikes!! !